Went out of our way looking for a stand because Stan saw one on the way back from work, but by the time we got there, it was down, probably because it was really cold. Figured we could sign them at the rally on Saturday, and if worse comes to worse we could always print them out and sign them and mail them in. But they were canvassing the neighborhood last night so we got it done. 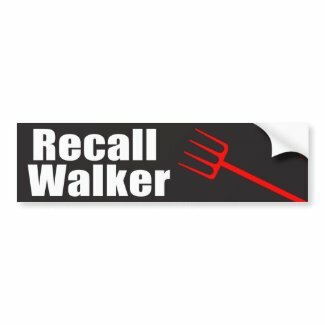 So I guess there’s going to be a “We Are The 99%” rally @ Ian’s Pizza off the capitol AND a Recall Walker rally on the capitol, both starting @ 11 am. Going against the restraining order. Get your protest stuff here. Stan and I got all of the square punk rock style anti-Walker pins, a couple palm tree shirts and some I Heart buttons. 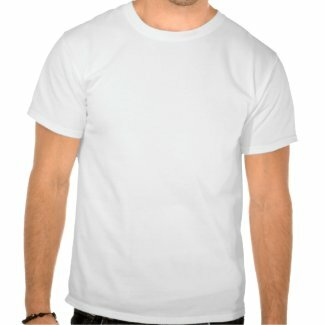 Zazzle produced very high quality output from my images. We’ll be wearing them tomorow as we go protest in the cold. In light of what is going on in my state, I’ve added more items to my Zazzle store. Buy “I ♥ WI 14 Merchandise! To the extent that there is an imbalance — Walker claims there is a $137 million deficit — it is not because of a drop in revenues or increases in the cost of state employee contracts, benefits or pensions. It is because Walker and his allies pushed through $140 million in new spending for special-interest groups in January. If the Legislature were simply to rescind Walker’s new spending schemes — or delay their implementation until they are offset by fresh revenues — the “crisis” would not exist. I wish I would’ve thought of this slogan! 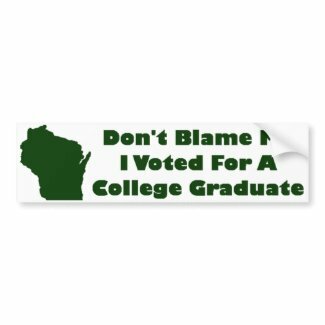 I found this on a site selling Wisconsin Merchandise via Zazzle (where my bumper sticker is #1 in WI bumper stickers, BTW!). I say demote Scooter the College Dropout to Janitor. Tempers are getting fired up in Wisconsin because of the Republicans trying to ram this Budget Repair Despair Bill through, and I’ve sold dozens of my bumper stickers so far. There’s a rally downtown the 15th and 16th, and we’ll try to make it on Wednesday. Wisconsin is the new Egypt! Except it didn’t take 30 years for people to get tired of Walker…he’s only been in office a little over a month. That’s just how awful he is. Walker is now Union Busting. He’s calling out the National Guard. Recall this neanderthal NOW. Wisconsin started this week on such a high note (Packers)…leave it to Scotty to ruin it for everyone (except his rich Republican cronies). Just heard it’s Charles Darwin’s birthday tomorrow. I guess Stan and I picked a good day to get married! Ironic that Obama would go to Wisconsin after the SOTU where he mentioned biofuels and high speed rail, both of which have been quashed by Scotty the Boxer. Of course everyone knows about the HSR and Walker, but wait, there’s more. He’s also ordering a biofuels project stopped in Madison. And he also doesn’t like Wind Energy either. But on a whimsical, unrelated tangent, Obama said that, coincidentally, a piece of Sputnik crashed in Manitowoc (where he was speaking today) back in 1962. Ironic that the SOTU mentioned Sputnik, as in Moment. And then he goes to Manitowoc. Weird. When I first moved to Colorado, I knew a Chihuahua named Spooty. Spooty peed and barked all the time. Spooty was owned by an old lady who lived next door to us. I didn’t like Spooty all that much, and he didn’t seem all that friendly. I suspect Spooty was named after Sputnik, because he was just about that old. Spooty’s owner’s grandson lived there too and had a beagle mix named Peaches. Peaches was the first dog that became my friend, but only through a chain link fence. I think Peaches liked my company better than her owner, who she seemed scared of. I wish I could see Peaches now that I’m a dog owner. Weird how we miss animals from our past, even if they weren’t our own. Also, Manitowoc is one of those places in Wisconsin that I wish I could live if I could live anywhere and Stan’s work and finances weren’t a problem. I would live right on the lake. Anywhere on any body of water in Wisconsin would be wonderful. For now, I’ll just settle for being between a couple of them. 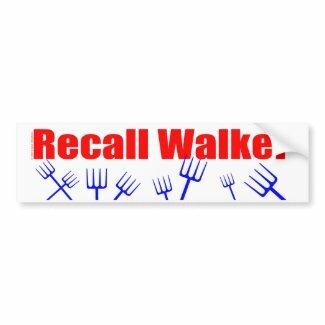 Buy Recall Walker Bumper Stickers! No, of course not, he’s a Baptist. It’s just a BALD SPOT. Now before anyone jumps on me about making fun of the follicly-challenged, I am not. I do find it strange that somehow he kept it hidden before he took office, then BAM! What other surprises does he have in store for us? It also seems sort of unnatural, like he’s still trying to hide something. Most bald spots have thinning hair around them as well, but it’s like he has this thick black hair, then a bald spot. And the stark black hair…he’s in his 40s. Shouldn’t there be some grey in there too? I am thinking he’s using some sort of product…and not a very discreet one. Not very discerning and makes poor choices. It’s also lopsided. It’s too far on the right. Metaphors, anyone? Oh good grief, I just read the wiki entry on him. He was born in Colorado Springs, land of the Mega Churches. Figures. One time Stan and I took a mini vacation to Colorado Springs back when we lived in Fort Collins. We were considering it as a possibility for grad school, and although I like Manitou Springs, Colorado Springs itself was insufferable, and the university there seemed like a desert wasteland. That was before the mega church thing really got started. So glad we decided against it…it would’ve been a really bad match. Kind of like the way Scott Walker will be for Wisconsin. Dubya’s been in the news lately. Both of them! Tweedle Dee and Tweedle Dumber! Who’s Dubya Two you may ask? Here’s a hint: Never, ever, elect a person with “Walker” in their name. Case in point: George W. (Walker) Bush. And now, Wisconsin has it’s own little junior achiever Dubya…Scott Walker! Yes! It’s the Walker curse! I was just telling Stan the other day how he is my absolutely most hated politician…even more than George W. And then I woke up to an epiphany this morning about the names. Weird, huh? Dubya II, you are an embarrassment to my state, asking the Obama administration to re-appropriate the $810 million for the high speed rail to be spent on roads, when clearly this grant was to create an infrastructure not reliant on fossil fuel. What a short-sighted little boy you are. You make George W. look like a rocket scientist. At least he finished his MBA. You didn’t even get a baccalaureate. Now governors of other states are saying “Well, give me the $810 million, then! !” They must think we’re a bunch of backward gas-huffin’ hillbillies here. And they’d be partly right. The percentage that voted for you…what is that…52% of the 40% of the eligible voting public that turned out to vote…those people ARE either gas-huffin’ hillbillies OR too stupid or too lazy to have researched the issues and the ramifications of you being elected. Stop right now. Quit fighting the train. Quit like you did college. Keep the federal funds, build the train. It might taste bad to you right now, but think of the future, when gas is $10/gallon. I thought you were about creating jobs? Instead, if you axe this project, you’ll be losing jobs. You’ll be losing businesses here that will be created by building the train. I voted for Barrett and Feingold. I just want to tap my heels and wake up from this nightmare. Please don’t think Wisconsin as a whole wants what Walker has in mind for us. I bet a lot of people who voted for him…business people in communities that would get the train…are now having regrets for what he is going to be doing.